They Don’t Want A State, They Want To Fight For One. So there you have it, Mr. Netanyahu bowed to Obama pressure and acknowledged a two states solution or word to that affect, depending on the inspiration of the journalist or the talking heads. I wonder, how many so-called journalist actually listened to (or read transcript of) the speech, They got pre-occupied with one aspect of the speech, perhaps one and a half if we count those who mentioned the settlements too. Patient: Doctor, I thing that I suffer from Amnesia. Doctor: How long you have been suffering from it? This looks to me as two states solution as two state solution can be AND that the solution includes … a Jewish state. 1947 Messrs. Obama and Smith! Not 2009! The leadership of the Jewish inhabitants of Palestine (the Ishuv) agreed to the plan whilst the Arab countries (repeat: Arab countries) rejected it, Note that the Arab inhabitants of Palestine, or their leadership, had no say on the matter. (also note that at that time there was no such thing as Palestinians, the inhabitants of area under the British Mandate of Palestine, were known as either Jews or Arabs). As the last British soldier left Palestine on 15 May, 1948, the Jews of Palestine declare the State Of Israel within the partition boundaries. The same day, the armies of Lebanon, Syria, Iraq, Trans-Jordan (Jordan), Egypt, Yemen, Saudi Arabia and a volunteers army called the Arab Liberation Army (note: no “Palestine” in sight) invaded the new country. 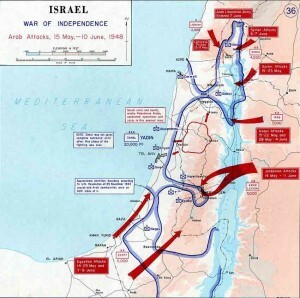 Israeli War of Independence erupted. All this is in the Netanyahu’s speech but the corrupt bumper sticker editors of the media would not mention it in a month of Sundays because it runs against the two state solution bumper sticker slogan advanced by the Grand Mufti of Washington DC in Cairo earlier this month. Have no doubt my friend, the invading Arab armies aim was to annihilate the new independent nation of Israel and carve the spoils amongst themselves, not to create another Arab country. They opposed ANY NEW state, not only the Jewish one. During the ensuing war some 700,000 Arabs left, BOTH the Jewish and the Arab areas of the partition plan, at the behest of the Arab countries. They were promptly rounded up in refugee camps in Lebanon, Syria, Jordan and Egypt. The Arab Refugee problem was born. Since 1948 the world has known many refugees problems, Europe, Eastern Europe, India-Pakistan, Korea War, Vietnam War, Cambodia, some in Africa and even as late as ten years ago in Bosnia. All such refugees problems has been resolved except the Arab (later renamed Palestinian) refugee problem, why? From its inception, the so-called Arab/Palestinian refugee problem was kept alive by the Arab government as a diversion from their shaky inept, often corrupt hold on their people. Whilst the Arabs are vocal when it come to Human Rights, they deny basic human rights to Palestinian living in their country. Despite Israel continuing declaration that it seek peace with its neighbours, the Arab countries not only steadfastly refused to recognise Israel but also had developed a common doctrine to annihilate Israel in a coordinated invasion as indeed they attempted and failed in 1967 and 1973. Israel security policies were to meet such threats through a one command military (IDF) which rely on reserve manpower, competent intelligence organisation (Mossad, Shin Beth and the Military Intelligence) and development of military and aeronautical industries to reduce dependency on imports and reduce the effects of Arm embargoes. The CIA assessment at the time was that the new state is unlikely to survive the (1948) war and if it did, having regard to its “socialist” background, in all probability it would join and be part of the Soviet bloc. America was “neutral”, the USA has no interest in risking its relation with the Arab world. The word “neutrality” has received a whole new meaning, George Orwell’s one. Whilst it was quickly realised that the CIA (and the State Department) were wrong on both counts when Israel supported the West in the Korea War, it took a further 20 years before president Johnson agreed to sell American weapon to Israel. Whilst the Arab countries were receiving weapons from the Soviet Union on a “never never” basis, Israel was forced to scrounge its weapon from whoever was prepared to sell it for cash. For nearly 19 years (between 1948 and 1967) the West Bank was under Jordanian rule, the Gaza Strip was under Egyptian rule, both busting at the seams with Arab refugees, (that what they were called) yet not a peep about Palestinians let alone about a Palestinian state. 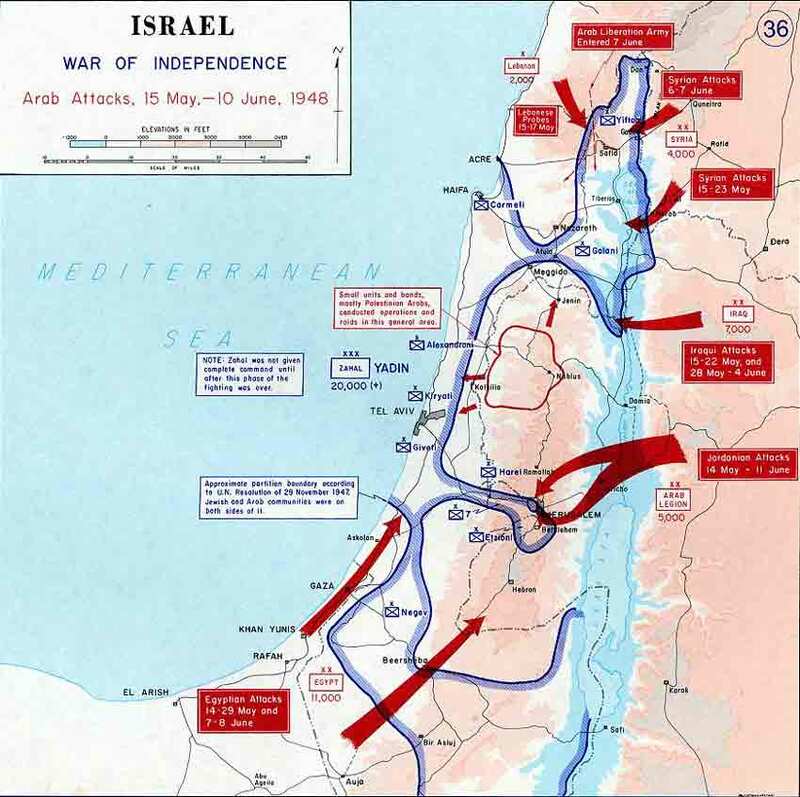 The Arab countries, quietly abandoned their doctrine to destroy Israel by a coordinated military invasion after their defeat in 1973 (Yom Kippur War). Indeed in 1979, Israel signed a peace agreement with Egypt and 1995 with Jordan. In 1959, Yassir Arafat, together with four others, founded the Fatah organisation and introduced the term “Palestinians” to mean the Arab inhabitant of the West part pf the British Mandate over Palestine that included Jordan of today in it. The aim of the organisation was to provide a venue for the newly created Palestinian identity to take charge of its destiny, namely, taking back Falastin (Israel) by force (terror). It was not until January 1965 when the first terror attack took place as the Fatah failed to sabotage the (Israeli) National Water Carrier. In 1964 the Arab countries created the Palestine Liberation Organisation (PLO), a parent organisation for a number of Palestinian terror organisations, including the Fatah, also defining the Palestinian nation and it right for land of Falastin, being Israel, the West Bank and Gaza Strip. Have no doubt, the Palestinian terror is the forerunner of the Global Islamic terror. The Muslim terror, that has no equivalent in any other religion, born out of Muslim Brotherhood principles, and was surreptitiously developed as “fine art” with training, equipment and propaganda, by the Soviet Union (and China to a lesser degree). The relation between the Left and the Palestinian terror was forged in Soviet training camps. As Communism itself survived the fall of the Soviet Union, so did the Socialist support to the so-called Palestinian cause. There is no single American university that respects itself that does not have department for Middle East Studies that are no more than a channel for vile Palestinian propaganda and sheer Anti-Semitism dressed up as “academic freedom”. Since the 1960′s Israel has been warning the West against idolising terrorists in general and Muslim terrorists in particular and calling for international measure against Muslim terror. But with a very few exceptions, most western countries look at the problem as an Israeli only problem, not an international one … until it hit home and even then, the fault was not Islam’s. As far as I am Concerned, Islam and terrorists are two words that do not go together. This is not politically correctness gone mad, this is not moral equivalence gone bad, this is mad!!! If such people are in charge of our safety from terror, God save us all! Too often the terror apologisers tell us that the terrorist are only a small core of extremists. Have no doubt, Muslim terror is NOT an action of a few radical nutcases, Muslim terror is a well coordinated world-wide movement, it is also known as political Islam. Political Islam, also referred to as radical Islam or Islamism (I hate this word, but this is another story) is the movement seeks to achieve a global hegemony of Islam, nothing short of that. The Muslim Brotherhood, Hamas, Hezbollah, Al-Qaida, Taliban Wahhabism are all example of Political Islam. Ehud Yaari, a well known Israeli commentator on Islam and the Arab-Israeli conflict explains that as the Arab countries have given up on destroying Israel (Iran is not an Arab country), Political Islam has stepped into the vacuum in the forms of the Hamas, Hezbollah, Islamic Jihad, and alike. They brought with them a new doctrine, muqawama, a doctrine that many seem to loose sight of its effects. Muqawama, which, incidentally, forms a part of the Hamas’s name, Ḥarakat al-Muqāwamat al-Islāmiyyah (Islamic Resistance Movement), means “resistance” but the muqawama doctrine is characterised by a lot more than just resistance and its affects are felt far beyond the Israeli-Palestinian conflict. Fight not for territory: That may seem strange in the “two states solution” age but the aim is not territory, THE AIM IS BLOOD, plenty of it and on both sides including innocent civilians, children and women. The aim is a war of attrition by blood letting, the more blood spilled the better. The sensitivity of the enemy (us) to our casualties alone will cause public outcry for surrender. Shahada: Martyrdom and death are objectives on their own right, the afterlife world is more important than the here and now. This is how suicide bombers are glorified. Fight not for victory: Victory is only a long term objective. This is part of the doctrine to avoid frustrations due to lack of real achievement in the short run. In fact muqawama doctrine has familiar tone to it, they don’t want to win, they want to fight. Further, if you understand muqawama, you would also understand why the Palestinian Authority, the so-called moderates (NOT the Hamas) was quick on their feet to reject Netanyahu’s speech not for what is in it, but for what is not. If you have been watching the Palestinian leadership, all of them, you would note that every time it looks as if they are getting closer to achieving a state they run away from it, under one pretence or another – indeed they don’t want a state, they want to fight for one. Nearly every Australian knows who Sol Trujillo is, he is the former Managing Director of our 6th largest corporation, Telstra Corporation Limited (Telstra), Market capitalisation above $30 billions). 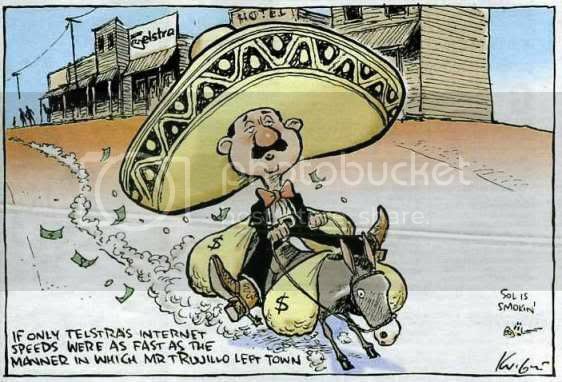 Mr. Trujillo is an American executive who was brought here by the previous government to run Telstra that was half way through its privatisation program, with a brief to maximize its share price and subsequently the government proceeds from completing its privatisation. Approximately three and a half years and $31 millions into Mr. Trujillo bank account later, thing have gone sour. Apparently senõr Sol is not too happy with us Aussies. Listen to an interview he gave the BBC recently, apparently after he left Australia. … the belief [in Australia] that only certain people are acceptable [for important positions] versus others that is a sad thing. Hey, senõr no certain Sol, you got the job, didn’t you?! What is important to note IS NOT the actual accusation against Australia and Australians but the swift and the ease in which a millionaire, by any criteria you wish to apply, portray himself as a victim. A sort of “fiddler On The Roof” in reverse. In Australia, whether your are Hispanic, Latino or simple Mexican, makes no difference to us, none whatsoever – our PC brigade is too busy with our own illegal immigrants, to include the good people of Latin America in the local victims list. Perhaps it was what senõr Sol referring to when he described coming here as “stepping back in time”, we are so backward here that we have not even appreciated our Latinos and elevated our entire Hispanic population, both of them, into victimhood. We take the Mickey out of you senõr Sol because we take the Mickey out of everybody and if you are a tall poppy, we’ll also cut you down to size and you certainly proved to be one. And when you decided that you need to bring two of your mates to help you to run Telstra, you did not think that we would pass on such a jam as “the three Amigos”. Instead of laughing with us you got mad, how dare the natives be so despicable as to have fun at the expense of the great man himself. To add insult to injury, when our Prime Minister, who as you know, not on my “admired” list, when asked to comment about Sol’s departure, he did it in a single word: “adios”. Oh well, if my prime minister is racist, I can’t help but being one too. I just wish that my prime minster will show his racist tendencies more often, particularly when it comes to who is allowed into this country and when, but I am digressing now. Sol Trujillo claim that a few Aussies approached him to express their support, he is right, I wanted to do it too but senõr Sol, has already left. I wanted to spare him the agony of racial discrimination and volunteer to be drawn with a poncho and a sombrero. I even volunteer to grow a Zapata moustache all for a small fee of … say, $1 million? That would still live Sol Trujillo with $30 millions, I don’t mind I am not greedy. Go home Mr. Trujillo, may peace be upon you in the land of unlimited opportunities, perhaps your emphatic credentials be better recognised at home and you get a nomination for …. the Supreme Court? Powered by WordPress v 3.5.2. Page in 0.231 seconds.